There aren't enough vegan Mexican restaurants in the world. I mean, there's plenty of Asian places, with mock duck and chicken drumsticks galore. But what about some good old-fashioned comfort food Mexican? What if you don't want to take your chances at a "regular" place, where all you can order is guacamole, chips, rice, and beans (and even then, you have to wonder about the lard factor)? Enter Flacos, a 100% vegan restaurant in Berkeley. 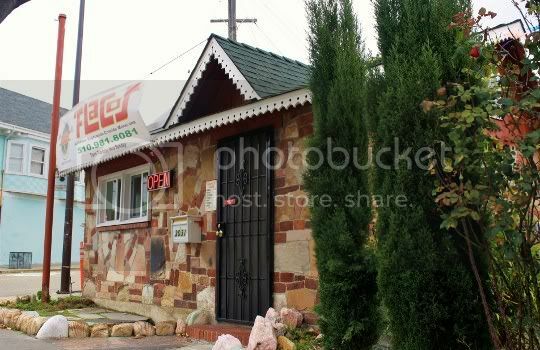 Sure, it's a bit of a hole in the wall, but let's be honest: don't some of those places have some of the BEST food ever? Flacos is definitely no exception. The owner is super friendly, and ready to explain every item on the menu to you in full passionate detail (this guy loves his food!). They have specials certain days of the week, as well as lots of discounts and perks. Oh, and they cater...how awesome! Ay caramba, the taquitos are AMAZING!!! Be prepared, they're super crunchy. I'm talking loud and potentially embarrassing crunchy. The shell has a flavor very similar to corn chips, with a meaty, stringy, beefy filling that is superior in the meat substitute arena. 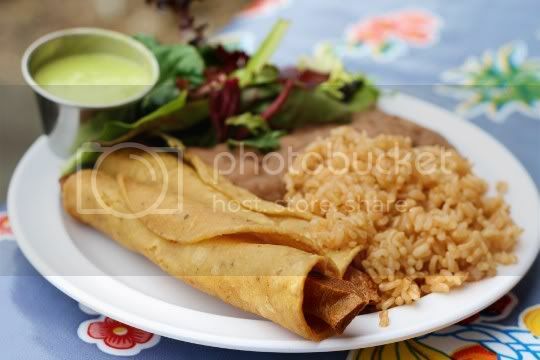 The taquitos are $2 each ($1 on Tuesdays! ), but the full plate comes with your choice of beans, brown rice, and a salad with tangy and spicy lime dressing. Although I attempted to order the pinto beans, the owner insisted I try the refried. I'm glad I listened, because they were phenomenal. Meaty and so well-seasoned, they're probably some of the best refried beans I've ever had in my life (and I've eaten a lot of Mexican food). And let me not forget the avocado salsa on the side: this light and fresh concoction of avocado and chilies is wonderful and is the perfect complement to pretty much everything on the menu. You have the option of mild or hot, but definitely go with the hot: it's spicy, but there's sort of a balanced cooling sensation in there as well. 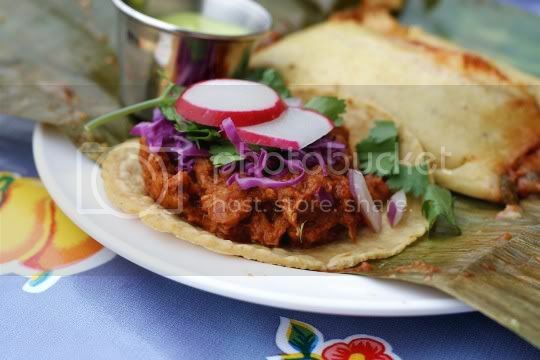 A juicy, tender, meaty mass of textured soy protein sits atop a chewy handmade corn tortilla, along with red onions, cabbage, and cilantro. Simply wonderful, probably my second favorite item after the taquitos. Although the deep red sauce immersing the soy didn't really taste like any mole I've ever had, it did taste great. Rich, smoky, tangy, and full of chile flavor (but not spicy!). The sweet, pungent red onions and fresh, crunchy cabbage are great contrasts to the flavor and texture of the soy, and lots of cilantro gives the taco that perfect astringent bite. And although they look small, these tacos are surprisingly filling. Two alone might be enough for a meal! This certainly was unlike any tamale I've ever eaten. Salty, tender masa filled with roasted poblano, those delicious refried beans, and what looked like shredded potato. The beans give the tamale most of its flavor, although the roasted bitter flavor of the poblano definitely comes through pretty strongly. I craved some tangy tomato-based salsa on top; you might want to bring some of your own, as Flaco's only seems to have their avocado version. 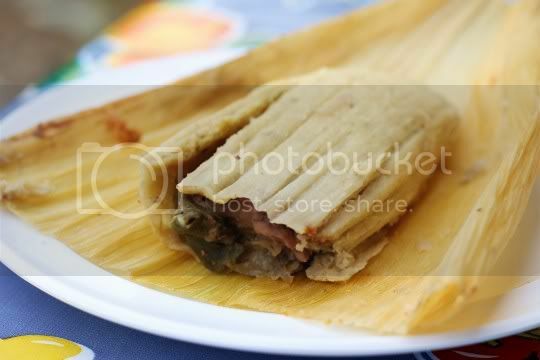 Although this is even more unlike any tamale I've ever eaten, it's easily one of the most interesting. The same tender, meaty soy protein used in the tacos is used here, along with shredded potatoes, capers, and green olives. Crazy, right? But it's surprisingly quite good, and I'm not even the biggest fan of olives. 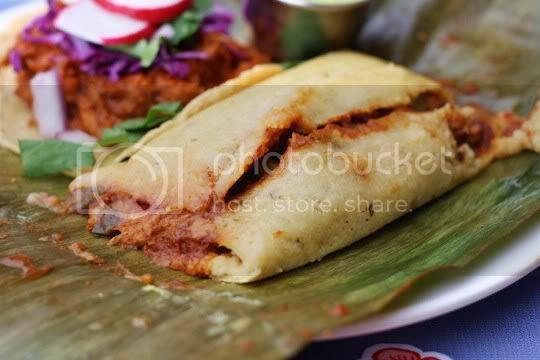 This definitely tasted pretty close to a real meat tamale, and the rich, red mole sauce soaks through the masa, so there's so much flavor in every bite. This tamale is great with the hot-cool sensations and flavors of the avocado salsa. Use liberally! 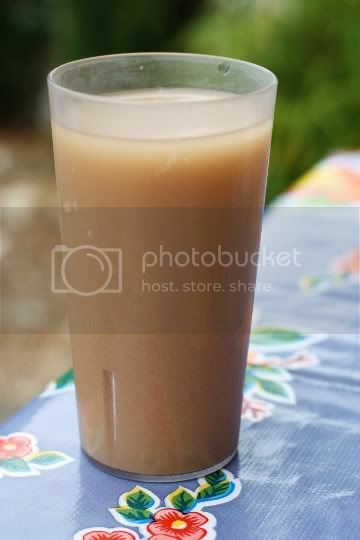 Mmmm, horchata. The sweet, milky, rice-based drink synonomous with Mexican cuisine. And not just for kids! Flacos' homemade version is super fresh and cinnamony, some of the best and most authentic I've tasted. There's none of that "just add water" flavor that you're probably familiar with; this is light, not overly sweet, and refreshing. Definitely worth getting with your meal! As they say, never judge a book by its cover. Flacos is hiding some of the best Mexican (not just vegan) food you'll probably ever have. They're passionate about serving delicious, hearty, and healthy food, and you'll definitely be back for more!